Celebrating our language, our culture, our multicultural Australia, 2nd Indian Community Languages Parents and Teachers Conference organised by Sydney Sanskrit School. 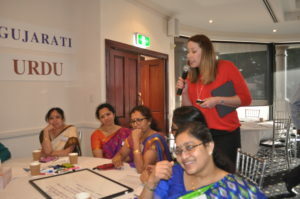 Teachers from over a dozen organisations representing Sanskrit, Hindi, Tamil, Telugu, Marathi, Punjabi, Urdu, Bangala, Malayalam, Kannada attended the whole day conference at Bell Havan Manor, Wentworthville on Saturday 8th July. 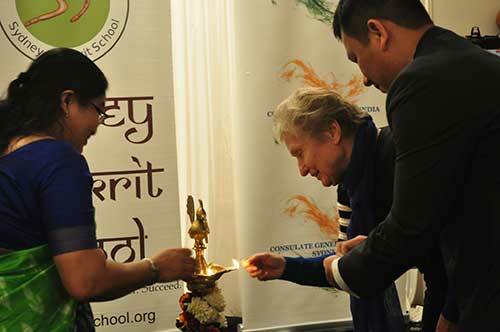 ha, Secretary, Sydney Sanskrit school. Welcoming the guests Vice President of the School Mr Sundareswaran Kaniyur acknowledged and thanked the support of NSW Department of Education and Indian Cultural Centre, Consulate of India, Sydney. 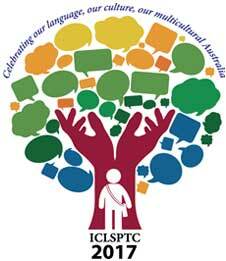 The ICLSPTC logo, “Celebrating our language,our culture our multicultural Australia” was unveiled by program ambassadors Ms Carmila Chand representing Sanskrit, Ms Amanpreet Kamal, representing Punjabi and Ms Sakshi Sethi representing Hindi. 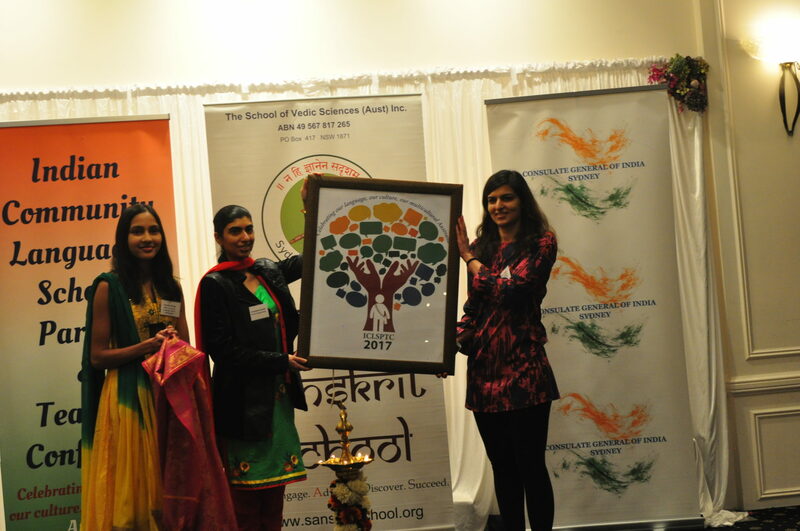 In a fitting tribute, the young ambassadors were honoured with a plaque acknowledging their commitment to the community language program by Sydney Sanskrit School and presented by Ms Jozefa Sobski, Chair, NSW Community Languages Schools Program Board. Prof Ken Cruickshank delivered a workshop on “Framework for Assessment of Languages” proposing the development of valid and reliable progression for Indian Community languages which can be assessed by class teachers. focused on introducing grammar components to learners at varying levels using fun approach. provided teachers with the tools, knowledge and confidence to create fun and powerful learning experiences for students using social media. “Lesson Planning & Motivation, teaching and scaffolding community language learning using different learning styles” by Mrs Mariana Lacek weaved the audience through the ever-changing expectations of education, children – diverse upbringings, personality and different ways of learning, barriers and how to overcome them, negative and positive states of mind. Young community language teachers Saumya Raman and Amanpreet Kamal gave an interactive presentation “Learning a community language – a learner’s perspective” with a focus on engaging the participants in concept mapping and task-based activities to address age and ability differentiation of learners. Teachers and committee from Mrs Shobha from IABBV Hindi School, Mrs Gurmeet from Revesby Punjabu School, Mr Aaksash from Green Valley Hindi School, Mrs Bharati from Telugu Badi, Telugu School and Mr Thiru Thiruananthkumar from Tamil School presented during the latter part of the evening. 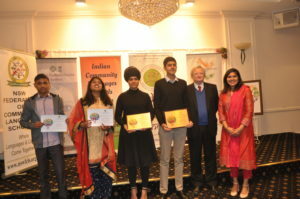 Ms Charishma Kaliyanda, Councilor, Liverpool Council and Mr. Pawan Luthra, Editor Indian Link News Media. Mr. Pawan Luthra, Editor Indian Link News Media.